Properties in Hartwell Park average 4.6 out of 5 stars. Property 7: High Altitude Heavenly View! Beautiful Cozy Log Cabin with Huge Views and Privacy. Property 8: Beautiful Cozy Log Cabin with Huge Views and Privacy. 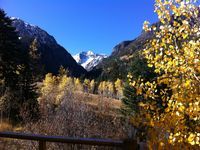 Walk to Everything in Ouray, ideal location! Great Rates! Property 10: Walk to Everything in Ouray, ideal location! Great Rates! 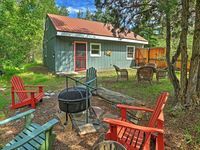 Ridgway 'Creekside Cottage' - Near Hot Springs! Property 13: Ridgway 'Creekside Cottage' - Near Hot Springs! BOOK NOW! Special rates for Sun-thurs with 1 night mininmum. Property 14: BOOK NOW! Special rates for Sun-thurs with 1 night mininmum. Private log home just 1 mile from Mountain Village Blvd. entrance. Property 20: Private log home just 1 mile from Mountain Village Blvd. entrance. Beauty as far as the eyes can see! Property 27: Beauty as far as the eyes can see! Internet needs work, outside of that very peaceful and fun! We took our family of five to this cozy mountain retreat. It was so much fun relaxing on the deck which offered tremendous, secluded mountain views. It was also fun to star gaze at night from this wonderful vantage point . The house is fabulous and we were very comfortable there . We appreciated the beautiful, well stocked kitchen and enjoyed all the amenities. There are also lots of fun things to do in and around the area. We can't wait to visit this property again! !